That belief extends to brewing my own beer. As a home brewer, the years of prohibition are seen as the dark ages, when a huge amount of brewing knowledge and recipes were lost during the Government black out of brewing. Sure, Americans still had beer during prohibition, but so many unique cultural beers were lost, despite the great melting pot of diversity making up our population. Bitter English ales, crisp and zesty French farmhouse beers, malty Trappist brews from Belgium, and a whole world of lagers from Germany, Austria, and the Czech Republic disappeared from our nation. In their place America became famous for watery, bland beers produced en masse on an industrial scale. So that brings me to this beer, Batch 19. It’s based on a pre-prohibition recipe for a lager, offering a window to what beer was like before Prohibition. It also uses two rather unique hops, Hersbrucker of German origin and Strisselspalt of French descent. I love Strisselspalt hops, even having thought about brewing a single-hop IPA with them. So I had the beer in my hand and was ready to check out, but I kept looking for the brewery's name on the package. It wasn't listed anywhere. I finally found a copyright printed in the corner on the bottom of the six pack: Coors Brewing Company, Golden, CO. What? I felt duped. Granted I still bought it, since I had invested 10 minutes of my life reading all about it and had my curiosity obviously piqued. So I swallowed my grumblings that if Coors is going to try to be a part of the craft brewing movement they shouldn't try to Trojan Horse their way in. A bit of research later, it seems like the story behind the beer is legit, that it is an old pre-prohibition recipe, and Coors has been very transparent saying that with today’s technology and raw materials, this is more of a tribute beer, in the spirit of early American brewing. I still felt mildly annoyed, but decided the proof would be in the pudding (or glass). Still, if I wanted a beer brewed by an old recipe, I could just get Franziskaner, which has been brewed since 1363, or a Scotch heather ale, which has been brewed since before the birth of Christ. And yet, Batch 19 didn’t disappoint. It didn't thrill me either, but it’s a nice, pleasant beer. It’s definitely a more robust lager than a traditional Central European lager, and far from the watery nothingness of many commercially brewed lagers. Online reviews seem to be middling, like mine. Most people find fault with the beer’s advertising route, not the actual product. 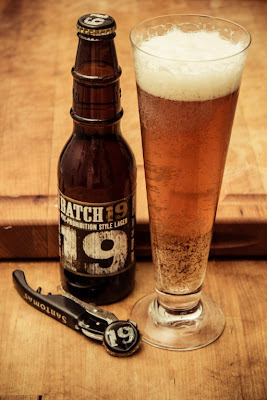 Batch 19 is an enjoyable beer, with a nice hop aroma and smooth, crisp finish. I’m not sure I would purchase it again, but I’m happy I tried it. Hopefully the town elders will forgive my trespass into the clutches of the Coors marketing strategy and not run me out of town with the other wastrels. Thanks so much! Glad you had fun.